What’s so interesting about right now is that while the internet advertising market is increasingly concentrated across a small number of players (the top 3 represent more than half the industry), the sheer number of new entrants hoping to feed off that economic model is exploding. These startups are largely in the form of apps offered through Apple’s App Store or Google’s Play Store, financed by flowing venture capital financing in a low interest rate environment. Also contributing to lower barriers to entry is that the cost to develop software products has plunged, due to open source software and application programming interfaces (API’s), which allow developers to build on previous innovations. Here is some data I found on Quora and in blog posts on the cost of launching a web/app product now versus in the past, to illustrate the point. On the one hand, with development costs ever lower, and with reusable software, it is logical to think that it might take less time for companies to become profitable. On the other, with more mouths to feed, it raises the question of whether the ad pool is growing fast enough to support all the new entrants vying for that form of revenue. To me, it looks like the latter is the more important factor, as it is taking companies significantly longer to become profitable, notwithstanding lower product development costs. In other words, the expenses to command consumer attention in a more cluttered environment are rising—through marketing and distribution deals—more than offsetting cheaper software development. In the table below, 10 companies are profiled for the length of time it took for them to become profitable. 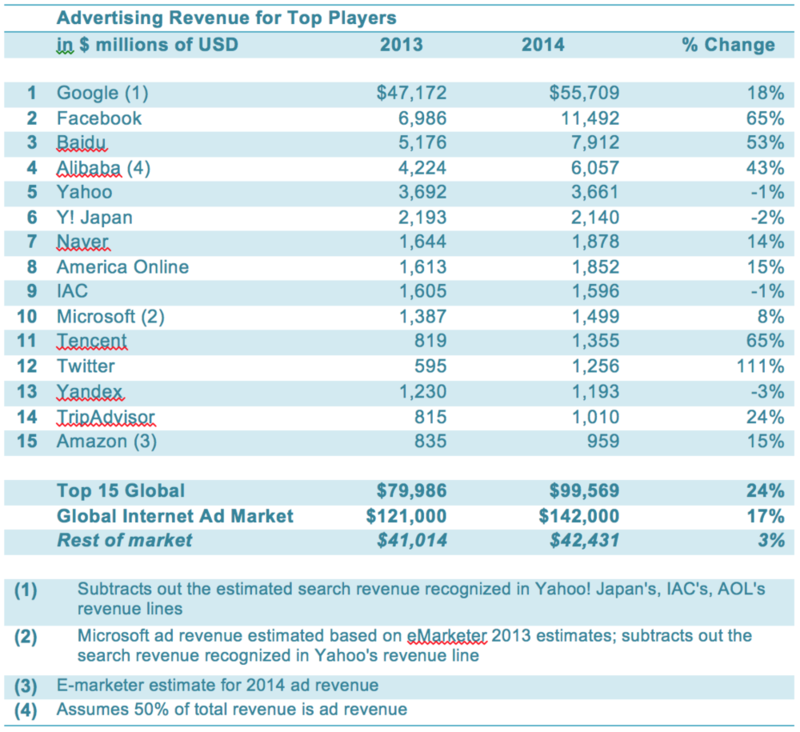 It is striking; Google and Yahoo! both became profitable within 3-4 years of their founding, serving about 30 million users and with revenue in the $100-200 million range. One was founded on search ad revenue and the other on display. Facebook and Twitter, which also serve huge user bases, came along later and took 6-8 years to become profitable, about twice as long. At their point of profitability, they had to reach 10 times the users and generate 10 times the revenue that Google and Yahoo! required to cover their costs. For the remaining six companies, it looks like it will take an average of 10-11 years to become profitable! For this group, it is projected to happen on widely divergent revenue and user bases. Some are more narrowly focused on specific user interest segments, such as real estate, travel, or music, and several also have very significant costs for streaming and licensing their content, increasing the revenue required to achieve profitability. Although YouTube is a part of Google, I think it is illustrative on a standalone basis too. The Wall Street Journal recently theorized that YouTube generated around $3 billion in revenue in 2013 and $4 billion in 2014, although they were still not quite profitable. I am assuming that 2015 will be the first profitable year, at a level somewhere in the $4-5 billion range. Another interesting point is that while it is clearly taking longer for companies driven by online advertising to become profitable, and at higher levels of users and revenue, the average revenue per user (ARPU) doesn’t vary so much at the point of profitability. There is a range, but $5.00-$6.00 per year seems to be a common level; lower if the business doesn’t have large content costs (search and social) and higher than the average if it has licensing and streaming costs. What this says is that it is taking longer and longer for ad-driven companies to get to the ARPU that typically allows profitability. And while I have profiled ten of the more established companies above, there are literally hundreds of others across the public and private markets that have been founded more recently. According to the National Venture Capital Association, internet companies attracted an almost 70% increase in funding to $12 billion dollars in 2014. This was the highest amount since 2000. This is across about 1,000 companies, of which an estimated couple of hundred are pursing an ad revenue business model. Among the highest valued are Pinterest, Snapchat, InMobi, Shazam, Upworthy, Reddit, Flipboard, Vox, Vice, Buzzfeed, and Huffington Post. Even if only 20% of the 1000 companies funding in 2014 are pursuing an ad model, it is still becoming a very crowded pool. I wonder if time to profitability for these will be closer to 15 years from their inception in many cases? Notwithstanding the massive market share movement online, the ad market as a whole, at $544 billion in 2014, has not meaningfully expanded due to the availability of online advertising. Ad budgets by major marketers generally increase each year in line with their expected sales forecasts, which tend to approximate GNP growth. According to Zenith Optimedia, the average annual growth rate for the ad industry for the last 20 years was 4.2%; for the last 10 years, it was 3.9%. As consumer time and attention has shifted to the internet, dollars have moved in kind from that overall pool, putting a damper on the growth of all other forms of advertising, print advertising in particular. This makes good sense; there is only so much attention that consumers have and if it moves from print to online, marketers’ advertising budgets will follow. Even within online, there has been disruption with a move to mobile devices from desktop / web access. Facebook’s Q1 2015 numbers show this well: marketers actually decreased their spending year-over-year on ads served to web users of Facebook, while substantially increasing their commitment to advertising delivered on mobile devices. This means a critical question is how much more penetrated in user time and attention the internet will become versus other draws—like broadcast, radio, and print—and in what kinds of products. The fact that there are new ways to reach consumers doesn’t really expand the pool of dollars as a whole; it tends to move them from one type of advertising to another. The key issue now, from my perspective, is that the online advertising market share gains from the advertising pool as a whole, are beginning to slow. While advertising on the internet has grown at a compound growth rate of 27% over the last 10 years, it grew at 17% in 2014, decelerating from 19% in 2013 and it is projected to grow 15% in 2015. I think online will continue to take share from the total market, but at an increasingly slower rate. Given all the new startups, an interesting question is whether the market is increasingly fragmenting, meaning there is room for new companies to take a piece, or consolidating, suggesting more limited opportunities? In 2014, the 15 largest online advertising revenue players generated almost $100 billion of advertising, amounting to 70% of the market. All together, they grew 24%, outpacing the 17% growth of the market as a whole, implying the largest companies are getting bigger. Said another way, a small number of established companies are increasingly taking share away from the smaller players. Note that Yahoo! Japan and Yandex grew much faster in local currencies but the strengthening dollar dampened growth reported in dollars. Excluding growth claimed by the top 15 global players, the rest of the industry only grew 3%, as noted in italics in the table above! It is possible that this is partly because the most exciting growth areas of online advertising—mobile and video—are largely going to Facebook and YouTube (Google), but it is an interesting point, nevertheless. Clearly, as the industry becomes more concentrated among the largest players with the biggest audiences—which is much easier for advertisers to purchase—the pool of what’s left is growing no faster than GNP, notwithstanding the larger and larger number of companies looking to claim a piece. An interesting area to watch will be how much of the big incumbent’s revenue is coming from newly funded startups that are more focused on generating traffic through downloads than revenue. I recall when I first joined Yahoo! as CFO, a very large percentage of the revenue at the time was being driven by companies with funding for marketing but no sustainable business model. If this is the case today in some of these large incumbent companies, there will be more disruption than many people realize. To be sure, advertising is only one form of revenue in this internet ecosystem; the commerce revenue from goods and services sold on line, travel being booked, and the sharing economy (Uber, Airbnb) are critical. At the same time, what’s largely free to consumers are the biggest traffic generators of all: social, search, communications (email/messaging), news and consumer-generated video content. And they rely largely on an ad model. Some ad-driven private or public companies may suffer value losses from current levels, because of a change in expectations regarding advertising growth. The consumer will increasingly participate in paying for an increasing percentage of the value of internet products, helping to offset less expansion in advertising fuel. The internet may start to poach the growth of broadcast advertising dollars more meaningfully in the next five years as online video viewership grows. None of the above are mutually exclusive, and I tend to believe all three will occur to varying degrees. A more detailed look at each of these three conclusions will be subjects of my future blog posts.